A couple weeks ago, the band recorded a video for the song. Those around the set in L.A. reported having seen angry extras fleeing the building in which the video was mainly shot. Because of Watchmen director Zack Snyder's directing the music video, confusion spread as to whether the new My Chem video was actually extra shooting for the movie. I can't wait for the video nor for the soundtrack! This is all so very exciting, especially to us MCR fans. I was fortunate enough to see the band play their Dylan cover at one of the shows I went to on their 2008 tour. On the second night of their playing in Chicago, they treated us to a little "Desolation Row". I couldn't find any really good videos from that show, but I found this clip of the song from their Vegas stop in March (which I almost went to, but ended up having extreme plan-changes. Grrr). 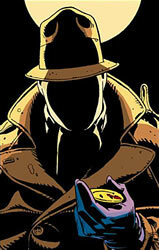 Keep watching for Watchmen updates. As soon as I can find a track-listing for the soundtrack, it will be here. love the new mcr rift,,, thanks your blog really was grand. i've met the boys and they are sooo nice i cant wait to see them next time they tour. Thank you so much for reading! I agree, it's going to be great when they tour again. I can only hope to meet them again, they're great guys.